I suspect many people would believe the occasional glass fishing float found on our shores is strictly a Japanese and Pacific Ocean phenomenon. Actually, the first glass fishing floats probably came from Norway and were used in the Atlantic. From 1762 to 1880, a Norwegian glass company was in business and it is believed they were producing glass floats as early as the late-1700s. The first time these “modern” glass fishing floats are mentioned is in the production registry for Hadelands Glassverk in 1841. The registry shows that this is a new type of production. However, there might have been some other versions of glass floats in use before that time. In the early 19th-century, the Schimmelmanns Glassverk (1779–1832) produced dark brown and very thick, bottle glass floats. Aasnaes Glasvaerk, in business from 1813 to 1883, produced 122,493 glass floats just in the year 1875. A glass float with Aasnaes’s mark on the seal button is a collector’s item. Early evidence of glass floats being used by fishermen comes from Norway in 1844, where small egg-sized floats were used with fishing line and hooks. 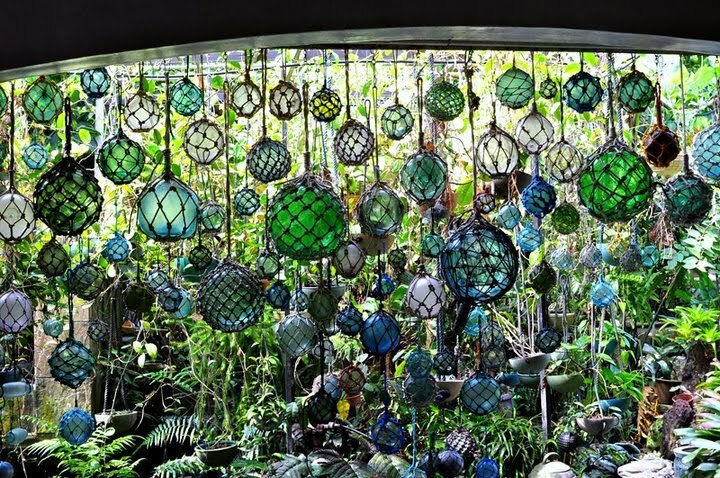 Around the same time, glass was also used to support fishing nets. The Japanese started producing small glass floats in the early-1900s and the first Asian floats came ashore along the West Coast just before 1920. These Japanese floats are part of early recycling efforts – initial Japanese floats we made from recycled sake bottles. Most floats are shades of green because that is the color of glass from these sake bottles (especially after long exposure to sunlight). Other brilliant tones such as emerald green, cobalt blue, purple, yellow and orange were primarily made in the 1920s and 1930s. The most prized and rare color is a red or cranberry hue. To accommodate different fishing styles and nets, the Japanese experimented with many different sizes and shapes of floats, ranging from 2 to 20 inches in diameter. Most were rough spheres, but some were cylindrical or “rolling pin” shaped. Asahara Glass Company had several factories and made a variety of sizes. Asahara made baseball- to orange-size floats for tako jigs, salmon gillnetting and seine fishing; grapefruit-size floats for seine and long-line cod fishing; basketball-size for tuna operations, bottom trawls and crab trapping; and the small rolling pin floats were used for tako jigs and troll fishing. The earliest floats, including most Japanese glass fishing floats, were hand made by a glassblower. Recycled glass, especially old sake bottles, was typically used and air bubbles in the glass are a result of the rapid recycling process. After being blown, floats were removed from the blowpipe and sealed with a “button” of melted glass before being placed in a cooling oven. This sealing button is sometimes mistakenly identified as a pontil mark (scar where the punt was broken from a work of blown glass.) However, no pontil (or punty) was used in the process of blowing glass floats. While floats were still hot and soft, marks were often embossed on or near the sealing button to identify the float for trademark. These marks sometimes included kanji symbols. A later manufacturing method used wooden molds to speed up the float-making process. Glass floats were blown into a mold to more easily achieve a uniform size and shape. Seams on the outside of floats are a result of this process. Sometimes knife markings where the wooden molds were carved are also visible on the surface of the glass. By 1939, millions of Japanese glass floats were being used; although Japanese glass fishing floats are no longer being manufactured for fishing, there are thousands still floating in the Pacific Ocean. By the 1940s, glass had replaced wood or cork throughout much of Europe, Russia, North America and Japan. Today most of the glass floats remaining in the ocean are stuck in a circular pattern of ocean currents in the North Pacific Gyre. Off the east coast of Taiwan, the Kuroshio Current starts as a northern branch of the western-flowing North Equatorial Current. It flows past Japan and meets the arctic waters of the Oyashio Current. At this junction, the North Pacific Current (or Drift) is formed which travels east across the Pacific before slowing down in the Gulf of Alaska. As it turns south, the California Current pushes the water into the North Equatorial Current once again, and the cycle continues. Although the number of glass floats is decreasing steadily, many floats are still drifting on these ocean currents. Occasionally, storms or certain tidal conditions will break some floats from this circular pattern and bring them to ashore. They most often end up on the beaches of Hawaiʻi, Alaska, Washington or Oregon in the United States, Taiwan or Canada. Today, most of the remaining glass floats originated in Japan because it had a large deep sea fishing industry which made extensive use of the floats; some were made by Taiwan, Korea and China.